Even D-list supervillains have to start somewhere. Follow Cal Stringel's misadventures as he climbs to the lowest levels of supervillany in the prequel to the smash hit, Confessions of a D-List Supervillain. Angry that he wouldn't be known as the engineer who made Ultraweapon's force blasters, Cal resigns to chase after a bigger, better paycheck. However, the Promethia Corporation isn't going to let him go that easily and sets out to make his life a living hell. Fed up at being pushed around by a company with an endless supply of lawyers and litigation, Cal sets out to build his own version of Ultraweapon's powered armor and take his revenge! What Cal doesn't count on is just how hard this is going to be. Along the way, he will make both friends and enemies and discover how hard hitting rock bottom can feel. Whether Cal is trying to smooth talk his way out of the prison for supervillains, haggle with nefarious employers over the price of his inventions, or battle with the Gulf Coast Guardians, he's in for one wild ride! He'll need to learn that when money is tight that everything has a price - from the cost of making weapons for a psychotic speedster to how much to charge for taking the blame for a drunken rampage through Las Vegas. I like how Cal thinks, he is devious and sarcastic, makes me laugh. While this book has funny parts the main emphasis is showing how Cal managed to have his life trashed so much that he became a D list supervillain. This book leaves you right where the Confessions of a D list Supervillain starts off. I had read Confessions quite some time ago and after listening to this book I went ahead and listened to it again. It was just as fun the second time around. If you’re a fan of the internet show of Dr. Horrible's Sing Along, you will like this. Narrator is perfect for the character Cal, shows his dry sense of humor. I couldn't put this one down. Great story and performance. I loved rooting for the anti-hero Cal Stringle. Everything the first book was and more! 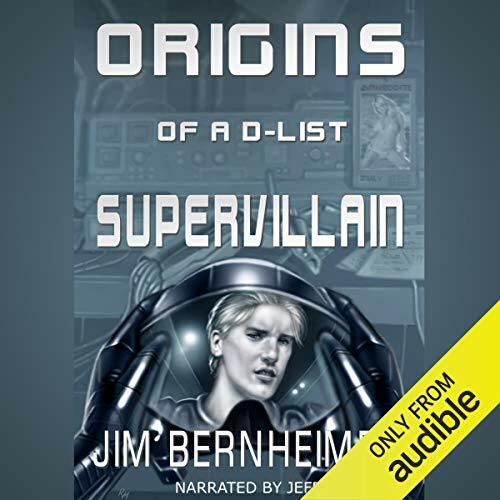 Would you listen to Origins of a D-List Supervillain again? Why? After the first book in the series finished I was really sad there wasn't a sequel. When I found Origins came out I was super excited! I loved every minute of it! I can't wait for the next book in the series. I wonder if Jim will abandon all other tasks in his life, so that we can get more of this series faster? I am normally not a fan of prequels, but this book changed my mind. I loved every bit of foreshadowing, and extra bit of details this book offered. I wish there was a way to give the author more of my money because he deserves it! A little more serious but still a great story. Definitely a MUST if you read/listened to Confessions. This fills in the few holes in the story told in Confessions. Oddly when I listened to Confessions I didn't realize nor care that this much of the story was left out. Bernheimer could give some much needed lessons to Richard K. Morgan. This was exactly as advertised- just a fun "light" read (meaning you don't have to take it too seriously). After some really tense, violent thrillers and gripping non fiction books I purchased this as a palette cleanser of sorts. The book is good and enjoyable. Was able to listen to the whole thing in one weekend as I did chores, shoveled driveway, etc. Cal is an interesting character and the first person present perspective made the story more interesting. I am going to immediately download the sequel, although I don't know if that is the right word since this book appears to have been written second. I recommend this book. There are some similarities to the Harry Harrison "Stainless Steel Rat" series, but the characters have their own identities. Well written, humorous and at times tongue in cheek, this book stands out from the crowd. Luckily I cam across this book after finding confessions (the book after this in the story) so I got to read this first then go onto the second. I loved it, was a lot of fun. If you like this then you will def like the next one too. I do usually go for longer books for a credit but in this case I think it was worth it. There was a lot I liked about this. It is entertaining from start to finish. It is intelligently written. The main characters are not handsome or beautiful, The main character falls in love with a girl more because of her brain and personality than her looks. I especially like the fact that the main character has no powers that he was born with. His powers come from a suit he invented. He has to have a side job to get money to make his suit. Not everything goes as planned. Some might get bored with the details in what it takes to make a suit, but other than that it is all good. I liked this aspect of the story as it made it seem more real. Kafer is a professional whose star is rising. 68 sur 91 personne(s) ont trouvé cet avis utile. Origins and Confessions should have been combined as one book. Instead Confessions was released first making you start at the middle of the story. Lucky I started with Origins and it gave me a good flow of the story and it is a good one. This superhero origin story told from the point of Cal is witty, humorous and sarcastic. The plot does not surprise but the characters are well crafted and grow with the story. A must have for every super hero and comic book fan. Had a great time listening to the entire series. This narrator is great. Gives you a feeling of film noir. Listened to all three of them. Highly recommended.